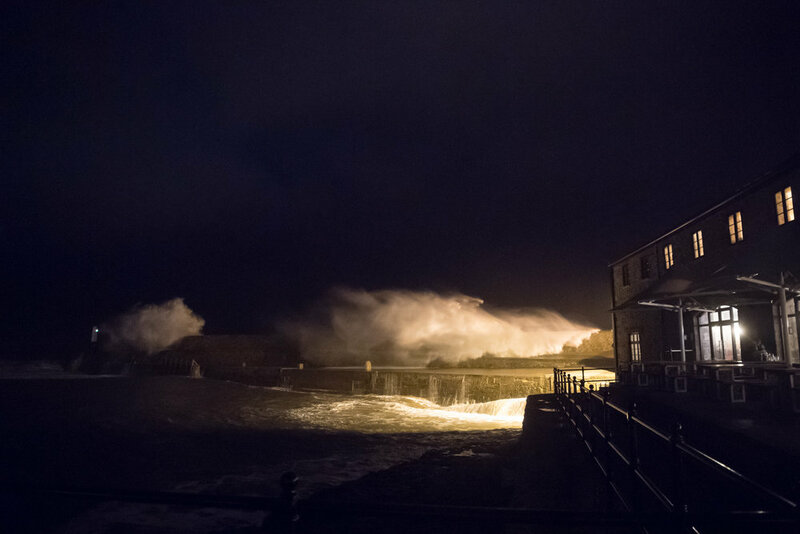 **I’m delighted to share that I’ve been shortlisted for the 2018 Sony World Photography Awards, Open Competition, among the 10 best in the “Landscape and Nature” category, with my night photo of stormy waves at Porthcawl. All the shortlisted photographers will be exhibited as part of the 2018 Sony World Photography Awards Exhibition at Somerset House in London from April 20th to May 6th, and will go on to compete to become category winners. I wouldn’t normally be the one who is the first in line to try crossing boundaries - but I think at one point things really change in people’s outlook in life, and their work practice as well - and that usually means new opportunities and experiments. The most common photographic fear (probably after missing focus) is raising the ISO setting on a camera, mainly because that will result in noise (chroma noise on digital cameras and grain on film). The recent improvements in camera technology make it possible now to shoot at ISO 1600, 3200 and even 6400 without an issue - with many of the newer DSLRs, micro four thirds and mirrorless cameras. But people are still afraid of it. Don’t want to delve into the technical side of night photography; yes, a tripod would be great, yes, lights and flashes work if you know what you’re doing but, at the end of the day, I believe it is about the photo and not the technicality side of it. There will always be situations when none of those things will work. And what will you do? I personally prefer to have the photo, even if it is grainy, rather than not having it at all. But it soon got darker and darker. 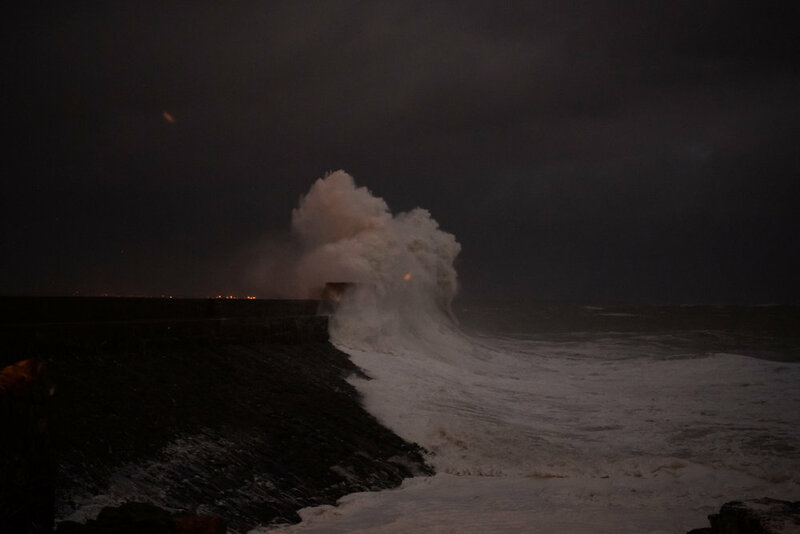 And the fury of the sea even more uncontrollable and, in a way, beautiful. Small balls of sea foam were flying everywhere. 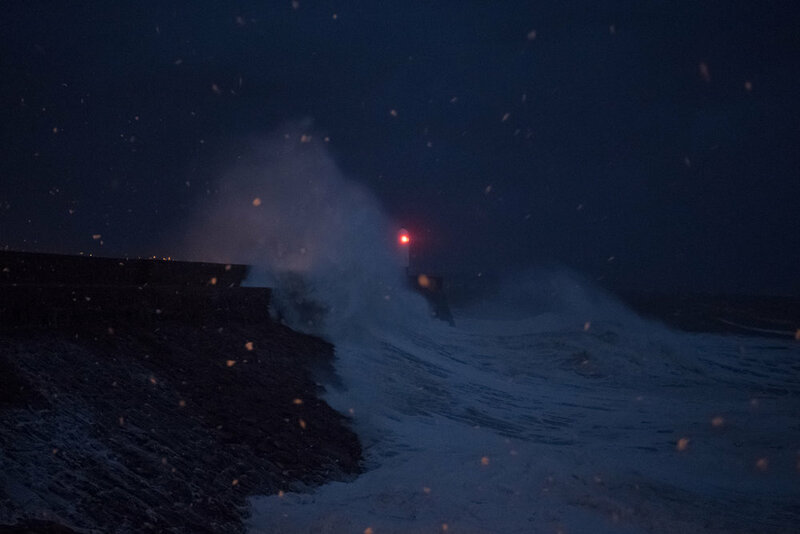 We could hardly see what was going on, and only the bigger waves could be seen, under the lights from the shore. Photos were a bit messy. I knew this without checking the back screen. ‘What am I going to do with that artificial red light reflected on these waves in the foreground, close to the shore? It doesn’t look right at all!’. But I had fun and no intention to stop. In time, all the people who ever photographed alongside me (and even my models) have noticed my stubbornness in photographing something, continuously, obsessively, as if I want to extract the very soul out of it. I don’t praise this method: it results in massive storage and selection issues. I admire photographers who know exactly what they want, and they go for it, focused and intentional, with no time to waste on “sideways" events. But at the same time I love what’s going on on the ‘sideways’ or in the background. Where reactions happen. Where another layer of the story develops. I started my photography practice with street photography - a continuously inspiring “place” where you learn how to “look” and where to find interesting things in a sea of mundane. And that habit - of looking and searching inside what is apparently uninteresting - stayed with me as well as my favourite teacher’s words: ‘Always turn around and see things from a different perspective.’ It is a bit literal but I went behind this pier. Darkness was so deep and dangerous that I didn’t even see where I put my foot, something not quite safe on that wet promenade. It was disappointing and a bit insane to shoot into the darkness at ISO 10.000 but I am glad I did it, and, today, a few weeks after that night, I cherish these pictures, and their imperfection (after completely dismissing them at first). There is a light that never goes out, I think, and that is my obsession for this unique setting; the light of the lighthouse and the light of my camera met somewhere in the middle, and danced this crazy late evening dance. Of course, I agree that we should strive to reach what can be called a technical and compositional perfection, a harmonious, aesthetically pleasant presentation of reality or of our imagination. But on the way there, in order to help ourselves develop, we shouldn’t forget about our instincts and our desire to play or discover things. I love how this image functions now as a perfect memory, and nothing else, and that it is taken after everybody packed, and left home. I love the fact that it is so imperfect, and it shows limitations but at the same time, madness. 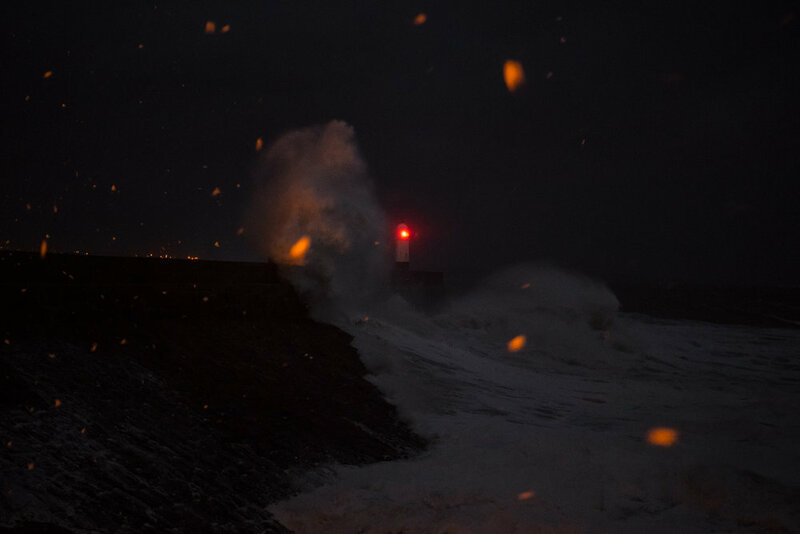 My “madness", in perfect tune with the sea and the tide, and with that stoic, hypnotic red light of the lighthouse. I love how one might think it is snowing when seeing those sea foam flurries flying everywhere that messed up the focus. And I love how you can only guess the town’s lights in the distance. Even on A4 (21 x 27 cm) noise is hardly visible, let alone at 500k Internet page pics. So why should one be afraid? Imperfection is beautiful and inspiring! Last shot of the night. Making mistakes or imperfect/incomplete photos show us what we can at a certain moment in time, in certain conditions, and it teaches us beautifully about what should we do if we want to improve. In any case, it’s a ‘win-win’ situation.